The ripe fruit of the deciduous shrub or small arbor plant Crataegus pinnatifida Bge. var. major N. E. Br or C. pinnatifida Bge. of family Rosaceae. Henan, Shandong and Hebei provinces, etc. in China. Slight smell, sour and astringent. Big, red scarfskin, thick sarcocarp and less stone. Dried in sun and cut into pieces, unprocessed or stir-baked. Sour, sweet, slightly warm; spleen, stomach and liver meridian entered. Promote digestion and dissipate food stagnation, activate blood and resolve stasis. It is sweet and sour in taste, slightly warm in nature and can promote digestion and dissipate food stagnation. It can be used for kinds of food stagnation syndrome especially the syndrome caused by improper eating meat and fat. 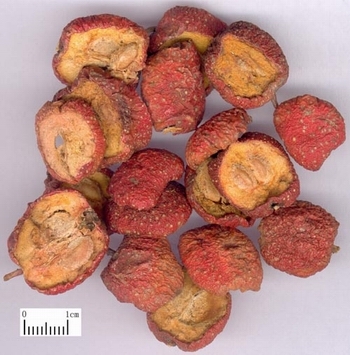 For meat stagnation manifested as gastric and abdominal distension, belching and acid regurgitation, abdominal pain and loose stool, it can be decocted alone or combined with other digestant herbs such as Lai Fu Zi and Shen Qu. For obviously fullness, it is combined with the qi-moving and food-stagnation-dissipating herbs. For instance it is combined with Mu Xiang and Qing Pi in Yun Qi San from Zheng Zhi Zhun Sheng. It is warm in nature and enters liver meridian and blood system, can activate blood, resolve stasis and stop pain. For hypochondriac pain it is usually combined with the qi-moving and blood-activating herbs such as Chuan Xiong, Tao Ren and Hong Hua. For postpartum abdominal pain, leukorrhea diseases, dysmenorrhea and amenorrhea, it is decocted with sweet water or qi-regulating blood-activating and menstruation-regulating herbs. For instance it is combined with Dang Gui, Xiang Fu and Hong Hua in Tong Yu Jian from Jin Yue Quan Shu. In addition, it can be used for abdominal pain due to diarrhea and dysentery and colic pain. 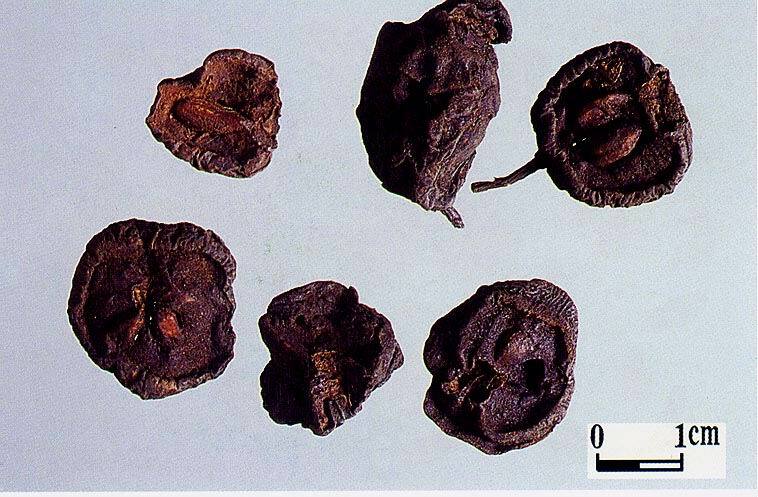 For abdominal pain due to diarrhea and dysentery, the charred one is used alone or with Mu Xiang and Bing Lang. For colic pain, it is combined with the qi-regulating, nodulation-dissipating herbs and analgesic such as Ju He and Li Zhi He, etc. It is also indicated for coronary heart disease (CHD), hypertension, hyperlipimia and dysentery. Decoct 10~15 g; large dose can be increase to 30 g. The unprocessed and stir-baked both are a bit on the side of promoting digestion and resolving blood stasis, the charred one relieving diarrhea and dysentery.